I picked up the phone and dialed. When he answered, it went like this…..
Brian: (wrapped in the warmest laughter) Hey!!!!! Ahhhh, Friendship bridges all gaps in time and space! So here he is ladies and gentlemen — the One and Only! 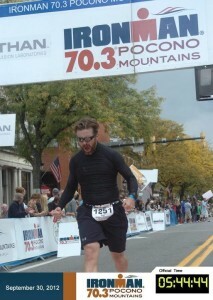 This is his finish line pic from the IronMan triathlon he did in the Poconos last fall. He typically doesn’t have the beard. But apparently, while he can do 3 amazing things at a time (swim, bike, run)….he can’t do 4 things at a time (swim, bike, run, shave!) 🙂 Love ya Bri! From there, it was just like old times. Diane dumps her worries and self-doubt. “I have the Unite Half Marathon in April, and the longest I’ve run since the Marathon is 3 miles!! AHHHHH!” And Marathon Brian talks her off the ledge. “It’s Ok…..you’ve graduated. You don’t have to teach yourself that you can do it anymore. You already KNOW you can.” S.I.G.H. He makes me all Zen. LOL, Not sure why. But I like it! It’s probably been about a month since I talked to him. We exchange emails. But work has been busy for both of us. Today was funny. When I called him, I used my Stamford, CT office phone number to call his New York City office line. But I was in Baltimore working the past 3 days, and his phone rang in Wilmington Delaware where he is working this week with the Portfolio Managers down there. LMAO — work can be c.r.a.z.y. sometimes!! That’s what makes running even more important! The stress relief is priceless. He’s training for another triathlon in May. He’s being the brave one and has been running outside in this bitter winter weather. I told him I was sick of it. The weather that is. That I feel like I’m holding my breath waiting for spring to break. He didn’t ride me for my decision — he agreed. The weather has been brutal lately. 20 degrees that feels like 10 or 0 degrees. The speed work I’m doing on the treadmill is positive, but he convinced me that i have to decide on a temperature and set that as a goal for myself. A temperature goal that will get me back outside again. I decided on 45 degrees. When it’s 45 degrees in the morning — i will run outside. 45 degrees plus the 20 degree running mark-up you get just from doing it —- equals spring to me! LOL. 45 degrees it is! C.O.M.E. O.N. 45!!!! I told him…that sometimes I still can’t believe i ran the Marathon. It almost feels u.n.r.e.a.l. that i did it. Weird, right? He seemed to understand. A month later I’m still so happy about the whole thing. The experience keeps paying me. My little Erin (lol, little — she’s 16 on Saturday! )….my Erin is doing Couch to 5K. She’s in week 5. Running 8 minute increments! I’m so proud of her. She’s really doing it! And my sister Debbie is doing it too. A fire has been lit in her and I could not be more proud of her. This weekend in Orlando is the Disney Princess Half Marathon — and Debbie is planning to go — check out the expo, check out the runners. There’s someting…..I think she sees herself….out there….one day. Go. Get. It. Debbie! I understand. You want it for yourself. Now, I want it for you too. Just like Marathon Brian wanted it for me! The Marathon Keeps Paying Me. I wonder if the Wonder of the Experience ever stops. Maybe Not. Maybe I’m changed forever. Maybe soon….I will have to struggle to remember what it was like pre-Marathon. LOL….that will be FUN!! you ARE changed forever M.D.